Manado Tua is an inactive volcanic cone island off the west coast of North Sulawesi, close to the capital city of Manado. Covering a total of 89,065 hectares, the Bunaken-Manado Tua park is among the most spectacular dive sites in the world. There is a good path to the top and the summit offers great views over the other islands and Manado Bay. In good weather you can see the smoking cone of Gunung Soputan those almost 60 kilometers away. The islands are separated from the mainland by a submarine trench that reaches a depth of 1,200 meters, and keeps these waters relatively free from city garbage and silt. The reserve is protected by law from spearfishing and coral or fish-collecting, as well as from dynamite fishing. It is not difficult to arrange a day trip to the island from Manado because of motor boats will take approximately one hour to cover the 10 miles distance. From Bunaken, another one of famous destination in Manado, it is about 30 minutes by boat to the village of Papindang on Manado Tua. You should be able to charter a boat from Bunaken to take you there and then back to Manado city afterwards for a total of Rp. 1 million or less. 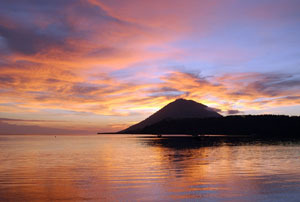 It is best to set out as early as possible from Bunaken to beat the worst of the heat and enjoy the spectacular dawn views of North Sulawesi’s volcanoes and islands. On land and underwater, Manado Tua is photogenic. Here, you can find the bigger fish such as the napoleon wrasse, giant trevally, eagle rays, snappers, groupers, and, occasionally, a hammerhead shark. But as currents here can be strong, only advanced divers should venture in these waters and best be accompanied by a diver experienced to these surroundings. On the east coast of Manado Tua, at Tanjung Kopi, or Coffee Point on the reef underwater plateau there are black tail barracuda and large schools of fish. Tanjung Kopi is also where hundreds of turtles lay their eggs at full moon. For those who do not dive, one can go snorkeling or watch the underwater sea life from glass-bottom boats. There are also jogging tracks and facilities for mountain biking and camping. The Sam Ratulangi International Airport of Manado receives Silk Air flights 4 times weekly from Singapore. Garuda Indonesia, Lion Air and Batavia Air and number of other domestic airlines operate daily domestic flights from Jakarta and Makassar to Manado, and also from Surabaya and Bali. From Manado there are cabin cruises available to the Park or motorboats for hire.